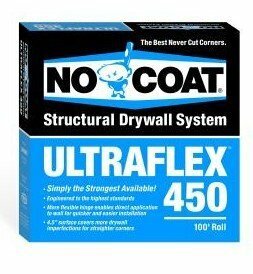 Why do we use NO-COAT Drywall Corners? We were working in a beautiful new home in Milford recently. The Owners had the home custom built with numerous unique built-ins, an awesome kitchen, two circular staircases, and many other beautiful features. The house is a 6,500 square foot eye-popper. It is new and it all looks beautiful—-FOR NOW. As I walked through the house I realized that within a year, drywall nail or screw pops will start appearing. Nail or screw pops are unavoidable as they occur when the house foundation settles and the framing shrinks and expands. Once the house reaches its equilibrium the pops can usually be permanently repaired. What can’t be corrected, at least not easily, are the long cracks that are likely to appear on the outside of drywall corners where the metal corner bead has been bumped into or where the wood below has shrunk. Adding mud over the crack will not prevent the crack from re-appearing later though this is the method that most Builders use to get through the warranty period applicable to new construction. In production building many Builders will often use less expensive products whenever they can get away with it. After all, they only have to warranty the house for one year by law. It seems that there is no end to the ways a production Builder can cheapen the product for the unsuspecting new Buyer. 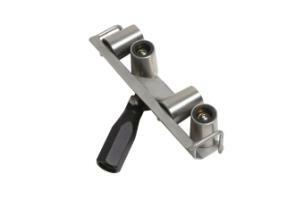 One cost saving method is to use metal corner bead for drywall. For more than 50 years metal corner bead was the standard. It was easy to install and it lasted. When modern finishing methods started to include drywall and not just lathe and plaster, Builders continued to use metal corner bead as there was no better alternative. Fortunately, that has changed. 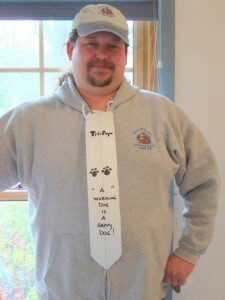 WWW.GRABBERMAN.COM offers a product called NO-COAT corners. Over the past 12 years we have converted from exclusive use of metal corners to exclusive use of NO-COAT corners. We use NO-COAT ULTRAFLEX 450 or ULTRATRIM ¾” Bullnose for exterior corners and the NO-COAT ULTRAFLEX 325 for interior corners. These products are composed of paper tape laminated to a co-polymer core. Since metal is eliminated there is no potential for rust stains which sometimes occur with metal corner beads. Nails or screws are also not used during the installation of NO-COAT corners. The product is packaged in either sticks or rolls. There is little waste with the rolls and it is nice to use one long piece rather than a bunch of pieces abutted next to each other. Also, the rolls take up much less space in the truck. The only drawback to a roll is the space and time needed for cutting. Installation is easy. Simply coat the wall with a thin layer of drywall mud (sold in a bag or bucket) and embed the NO-COAT corner as you would any other paper or fiberglass tape. The initial coating can be accomplished with a drywall knife or with a corner roller dipped in a bucket of mud. Once the mud is on the wall, press the NO-COAT corner into it and squeeze out the excess drywall mud, wiping it away with your knife. We use the NO-COAT corners exclusively so we found it helpful to purchase the accessory installation tools which speed up the embedding time substantially. Using the accessory tools (shown below), press out the excess mud in one quick motion rolling over the inside or outside corner. For Bullnose corners the process is the same except that the drywall must be cut back ½” on each side to allow for additional mud to go behind the bullnose and allow the piece to adhere at the correct angle. Once the corner is set in the mud, use a mudding knife to immediately apply another coating of drywall mud and trowel until smooth. NO-COAT is stronger than standard metal corner bead. Tests were performed by Grabber using 5 lb weights dropped from different heights onto equal lengths of finished corners composed of either metal corner bead or Grabber NO-COAT corner. The damage to each of the corners was examined. 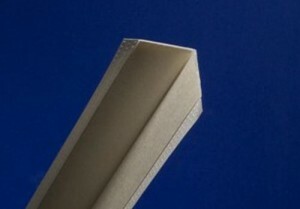 In every single instance the NO-COAT corner performance was superior to the metal corner bead. I first discovered proof of this myself on a job site. I was carrying a solid core door into a room and I accidentally ran into one of our finished NO-COAT bullnose corners. I hit the corner head-on, not with a glancing blow. The corner took the full force of the weight of the door and my momentum and it did not crack! I was very surprised as I had expected substantial damage to result as I have witnessed with metal corners. We usually purchase our Grabber NO-COAT corners at Ryan Building Supply in Southfield http://www.ryanbuildingmaterials.com though there are other suppliers catering to drywall professionals that carry the NO-COAT products within metro Detroit. Retail customers can purchase a limited supply of NO-COAT products at http://www.homedepot.com or http://www.amazon.com. Do not be fooled by other products that have similar characteristics. We have tried a few only to be very disappointed with the results. We don’t feel that it is worth the risk of a call-back to repair a crack resulting from using a product other than genuine NO-COAT corners. While the cost of the actual NO-COAT corner material will likely be two to two and a half times more than metal corner bead we find that the labor savings, durability, and customer satisfaction are well worth the extra cost. I am reminded of a fairly new house in Shelby Township where we spent nearly a week removing dozens of failed metal drywall corners back in 2007. There were long cracks along the edge of many of the metal corner beads. Unfortunately, the Builder’s warranty had expired so the Homeowners had to bear the full cost of the repairs themselves. After removing the metal corners, all of the fasteners, and the drywall mud build up, we installed Grabber NO-COAT corners. In addition to repairing the corners, we also had to repaint dozens of walls. It cost the Homeowner several thousand dollars for the repairs which could have been avoided had the Builder not tried to save what would likely have amounted to less than $100. In December of 2014 that same Homeowner called us to work on another damaged drywall area in her house. While I was there I inspected all of the corners that we replaced back in 2007. They all looked like the day that we finished the repairs. There was not a single dent, ding, or crack visible on the NO-COAT edges while several new cracks had appeared along the metal corners that were not previously displaying any damage. The metal corners continue to fail while the dozens of NO-COAT corners have proven just why Grabber can offer a Lifetime Warranty against defects with their corners.